Born in New Zealand, Nacewa began playing rugby at the age of five and first gained provincial selection age 20. At the 2003 World Cup, a 21-year-old Nacewa was called into the Fiji squad and spent two minutes on the field and reportedly had no idea this would render him ineligible to ever play for New Zealand. He made his Blues debut in 2005 against the Highlanders and went on to earn 44 Super Rugby caps while also making 54 provincial appearances for Auckland. In 2007, Nacewa was voted the Player of the Tournament after guiding his Auckland team to the Air New Zealand Cup title. Nacewa has also proved to be equally capable of playing at fly-half as he is at centre, wing and fullback. 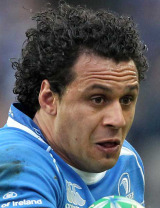 He joined Leinster on a two-year-deal in 2008 and was a key player in their Heineken Cup success in 2009. In 2010 he signed a new three year deal with the province and was rewarded for a stand out season the following year with the Irish Rugby Union Players' Association Players' Player of the Year - becoming the first overseas player to claim the honour.